Patrick Trahan (2010 Dakar competitor and Canadian) has a new adventure lined up for the Spring of 2011. He's going to circumnavigate Africa, by himself, without support and the money raised for the event will be given to the Children's Wish Foundation. More details of the event can be found on his facebook page HERE. 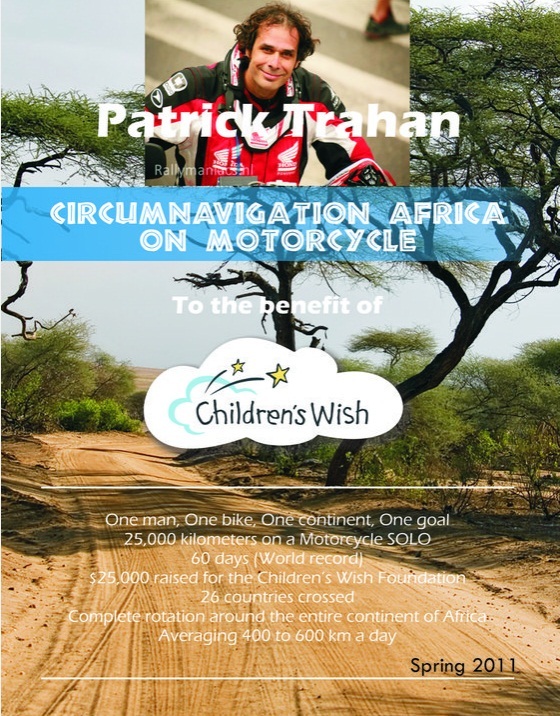 Follow Patrick Trahan has he attempts a circumnavigation of Africa on his Honda motorcycle solo and no support! he will raise funds for the Children's Wish foundation of Canada. His goal sell the KM of the expedition 27,000. Each kilometer are sold 1$. Plus achieving a world record. Keep posted for the web site!